There are many different types of trailer used in the transportation of standard and abnormal loads. Here are just a few examples. Dimensions and weights are as a guide only and will change on the number and type of axles as well as the tractor unit used. (Mega similar to 3 axle semi below) with sliding roof. Mega 3.50+10.00 x 2.45 x 2.70/3.00 lower deck height 0.85 – 1.00mtrs. Payload up to 28 tonnes depending on country. 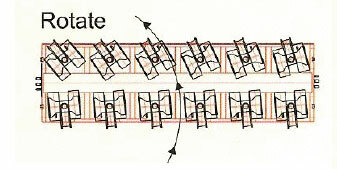 Standard flat trailer dims 13.60 x 2.50 with extendables having an overall length up to 28.00mtrs. Payload up to 85 tonnes depending on number of axles, make and model of trailer and tractor unit. Could have up to 8 axles. Payload up to 100 tonnes depending on number of axles, make and model of trailer and tractor unit. Can have steering axles, out riggers, wheel wells, detachable neck, fixed or removable ramps. Payload up to 38 tonnes depending on number of axles, make and model of trailer and tractor unit. Can have steering axles, out riggers, detachable neck, removable ramps for loading front and rear platforms. Payload up to 68 tonnes depending on number of axles, make and model of trailer and tractor unit. 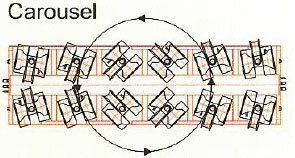 number of axles fitted as shown in the forth example.